Romelu Lukaku has been in sensational form for Belgium for some time, and he continued his fine goalscoring run against Switzerland on Friday night. The 25-year-old hasn’t quite been able to replicate it for Man Utd in recent weeks, as he’s failed to find the back of the net for the Red Devils in his last three Premier League outings. 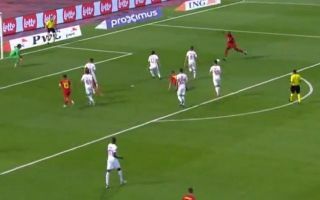 However, put him in a Belgium shirt and things seemingly change, as seen in the video below, as he produced a great finish to force his effort into the back of the net to give his side the lead against the Swiss. Impressively though, that’s now 27 goals in his last 28 international appearances as the forward evidently relishes playing for his country and continues to be the talisman that coach Roberto Martinez wants him to be. As far as United fans are concerned, they’ll just hope that Lukaku can score goals as regularly for his club as he does for his country moving forward as they wait for his return to Carrington next week before facing Chelsea on October 20. The Manchester United man gives Belgium the lead against Switzerland.